Much like Michigan will benefit from having Mississippi State game film against a team with a similar offense, Michigan also played against a team with a very similar offensive strategy to the Bulldogs. That's the good news. The bad news? 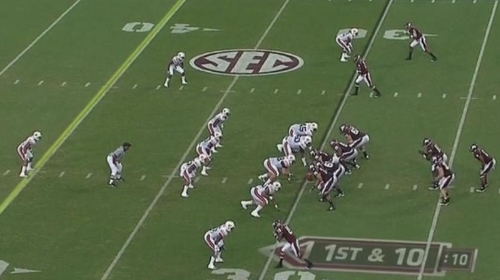 Mississippi State runs basically the exact same offense as Illinois. The same Illinois team that put up 65 points on Michigan's defense. Michigan saw this alignment a lot against Illinois. The player lined up next to Mississippi State QB Chris Relf is the B-back, who will run a dive play, while the A-back behind Relf acts as a traditional option back should the QB pull the ball. They also run a fair amount of traditional shotgun formations, but almost all of the plays include some sort of pre-snap motion and reads. The Bulldogs have thrown the ball 265 times this year (32% of the time) and run the ball 561 times (68% of the time), and rightfully so. Starter Relf is completing only 56% of his passes. But you don't have much incentive to throw the ball when your quarterback is a 6'4", 240 lbs mantank that runs people over. Like MGoBlog noted, Relf is more Cam Newton powerful than Denard shifty. Expecting the Ray Vinopals of the world to make wrap-up tackles against Relf is a pipe dream. Watching him steamroll a good Auburn defense didn't bode well for Michigan's ragtag group. Relf doesn't throw the ball much, though, averaging just 16 attempts a game, which is good news for Michigan's secondary. 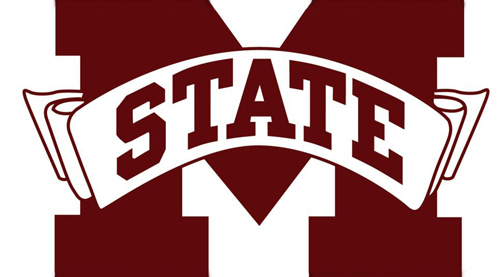 Like Illinois, however, Mississippi State runs a nominal two-quarterback system. "Backup" Tyler Russell was often deployed as the passing quarterback against Auburn, coming in on long yardage situations and given the occasional drive. He's not much better, completing only 58% of his passes, but he'll be a variation that Michigan will have to account for. When Russell comes into the game, however, Mississippi State almost completely abandons the pre-snap motion and option game. Russell is a pretty standard drop-back quarterback with uninspiring wheels. He'll give Michigan another look to prepare for, but they'll need to worry primarily about Relf's running ability. Many of Relf's passes ended up being designed QB rollouts, and we've all seen how Michigan fares against those. Unless Michigan has improved in their defense of these, it could be trouble. Then again, Relf's passes are often off target. When Mississippi State gets behind the chains, their drives often stall. Their offense doesn't have a ton of big-play ability in the run game, and the passing game is atrocious in third and long situations. Aurburn's Nick Fairly repeatedly blew threw their offensive line in these situations and caused havoc in the backfield. In general, the Bulldogs' offensive line seemed to have trouble in pass protection. Against Auburn, which ran primarily a cover-2, Mississippi State went to the corner/fade route over and over again (a pass behind the corner but in front of the safety). It was their most consistent and effective passing play despite several drops and overthrows. Frankly, not great things. Mississippi State's offense looks remarkably similar to Illinois', which thoroughly torched Michigan's defense all game. They look to break contain and get to the outside--something Michigan frequently allows--but if you over pursue, they have counters to get the ball back up the middle. Relf is basically a 6'4" version of Scheelhaase except marginally slower, older, and possibly a better passer. If Michigan doesn't show any adjustments from their defensive formations against Illinois, this could be another ugly performance.